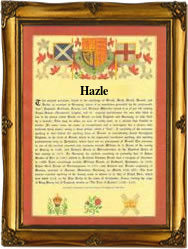 Recorded in a number of spellings including Hazel, Hazle, and Hazell, this is a surname of English origins. It may be of Anglo-Saxon origin, and topographical name for someone who lived near a hazel tree or grove, deriving from the Olde English pre 7th Century "haesel". Secondly, it may be of Old Norse origin, a locational name from places so called, for example "Hessle" in the East and West Riding of Yorkshire, and "Heazille Barton", "Heazle Farm", in Devonshire, deriving from the Old Norse "hesli" meaning hazel grove. The surname dates back to the late 12th Century (see below), and early recordings include Hugh de Hesill (1204), in the Assize Court Rolls of Yorkshire, and William atte Hasele (1275), in the Subsidy Rolls of Worcestershire. Variations in the spelling of the surname include: Hazel, Hazael, Hasel, Hasell, Haisell, Heazel, Heazell, and Hessel. London Church Records list the marriage of John Hasell to Margaret Rownde on December 2nd 1553 at St. Margaret's, Westminster. Samuel George, son of James and Sarah Hazael, was christened on April 22nd 1831 at St. Mary's, Lewisham, London, and George Hazael married Elizabeth Ball in Stepney, London on April 25th 1870. The first recorded spelling of the family name is shown to be that of Alured del Hesel, which was dated circa 1182, in the "Studies on Middle English Surnames", Worcestershire, during the reign of King Henry 11, known as "The Builder of Churches", 1154 - 1189. Surnames became necessary when governments introduced personal taxation. In England this was known as Poll Tax. Throughout the centuries, surnames in every country have continued to "develop" often leading to astonishing variants of the original spelling.